I don't know about you, but I just don't have the time. Literally. To do the things I do. Like cook at home or heat up an oven. That's why my new best friend is made of stainless steel and sits happily on my brick patio. His name is Weber Genesis, and he's super cute. I spend all of my time with him outside, because he heats up super fast and grills my food perfectly with almost no help from me. I think my husband is jealous of my relationship with our new grill. One of my favorite things to cook on the grill is a giant filet of salmon dotted with butter, sprinkled with salt and pepper, and surrounded with fresh dill and lemon. As delicious as it sounds, it tastes and smells even better. 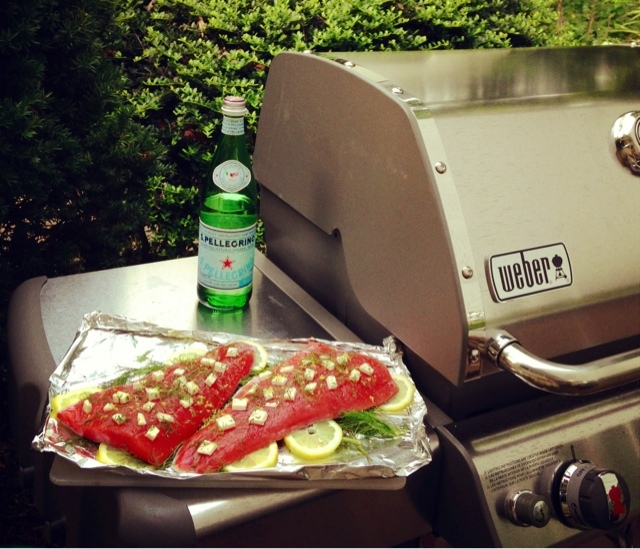 The salmon never actually touches the grill because it's nestled in a foil pouch and laid on top of a bed of dill and lemon. This keep the presentation clean while still imparting the salmon with all of that "grilling goodness" (that is a technical term. Look it up). So, if you find yourself way too busy to, I don't know, do much at all, consider this salmon for your next date with the grill. 4 ingredients nestled together in perfect unfussy harmony. Zest the lemon, then slice. Set aside. On a large piece of foil, lay flat roughly 4 stems fresh dill and 6 lemon slices. Place salmon filet on top of dill and lemon skin side down. Sprinkle with salt, pepper, lemon zest, chopped dill, and dollop with butter. Place in the middle of the grill. Close the top. Cook for 15-20 minutes until desired temperature (should be flaky on the outside and pink in the middle). LOVE the grill. We have an awesome charcoal Weber grill, but I have been longing for something with a quicker start so that we grill out more on busy weeknights. LOVE this grill. We have a great charcoal Weber grill but I have been longing for something with a quicker start so we can grill on busy weeknights. And also it's SO nice to not heat up the house! Lovely salmon! That is a great grill, one of my favorite brands to work with. The salmon looks gorgeous!